The RC F has been tested – and proven – on some of the world’s most challenging race circuits. This includes its home track of Fuji Speedway in Japan, which is the source of this sedan’s “F” designation. Under the hood, relentless, no compromise engineering produced the heart of a lion: A naturally aspirated 5.0 litre V8 that delivers 467 peak horsepower, up to 389 lb-ft of torque, and a heartfelt tone that ranges from a throaty growl to a mighty roar. This performance-driven engine switches between Atkinson and Otto cycles to maximize power, torque and efficiency. To drive the rear wheels, it’s mated to an equally motivated transmission: a uniquely tuned eight-speed Sport Direct Shift transmission. To keep the driver fully engaged with the road, the RC F sports a highly rigid body with large cross-section rocker panels and a stiff front lower brace. This works in concert with the RC F’s Adaptive Variable Suspension systems, which automatically and independently adjust the performance damping at each wheel depending on road surface and driving style. The result is exceptional levels of control. 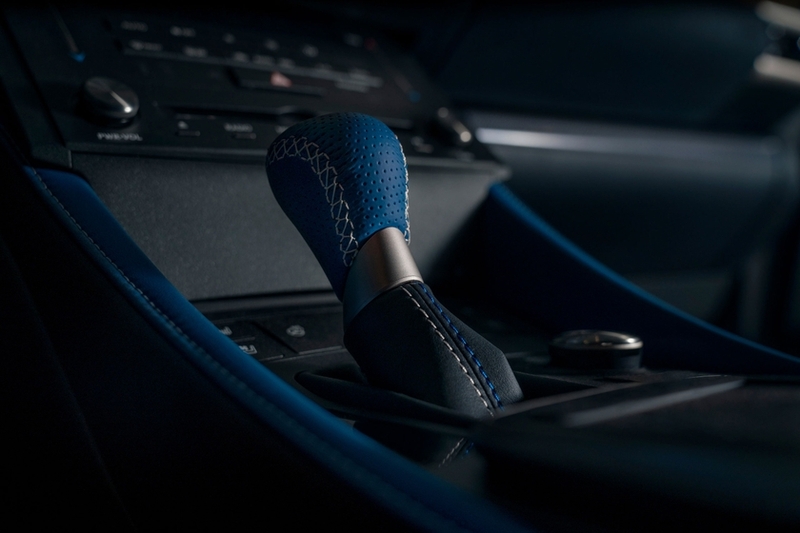 The Lexus RC F’s Drive Mode Select system allows the driver to fine-tune the vehicle’s balance between performance and efficiency to match the needs of the moment, the mood, and the road conditions. In addition to Eco, Normal, Sport and Sport+, a new Custom Mode lets drivers adjust the operation of the powertrain, chassis and air conditioning to suit their personal preferences. 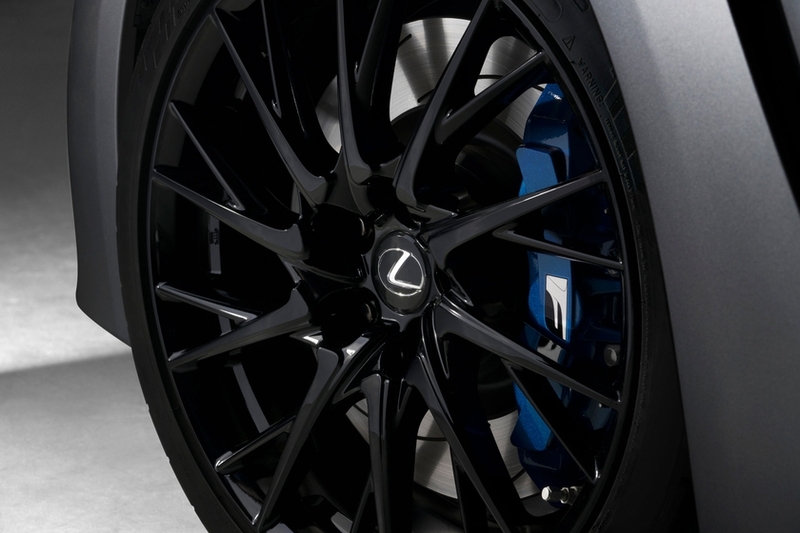 The RC F’s muscular strength demands an equally impressive amount of stopping power. From everyday, restrained use to all-out driving on race circuits, massive Brembo disc brakes are designed for high loads with six-piston front and four-piston rear monoblock calipers. 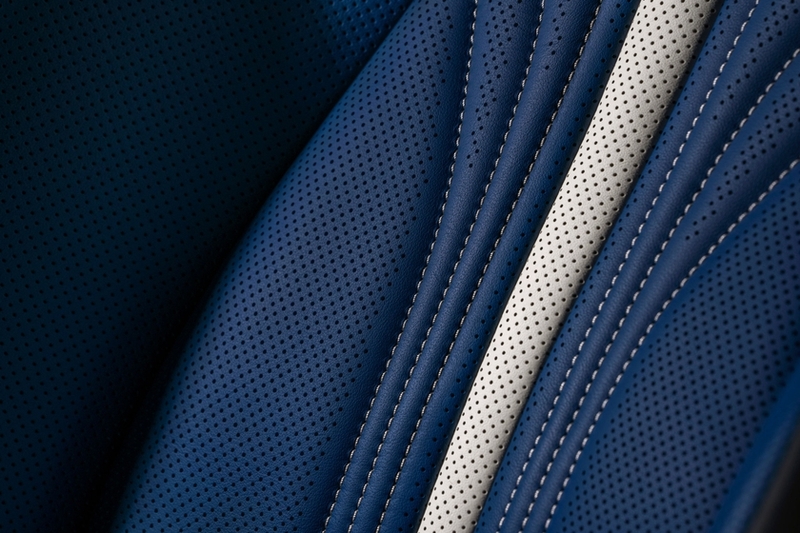 Slots in the discs help keep pads clean and effective, while spiral fins provide excellent cooling. Curbside, the 2019 RC F is instantly recognizable as an F model. The signature Lexus spindle grille with distinctive F series mesh pattern dominates from hood line to lower lip. Large air scoops flank the grille, while the aerodynamically sculpted form includes carefully tuned underbody and aero stabilizing fins. The two-door coupe’s silhouette is low, wide and fast. 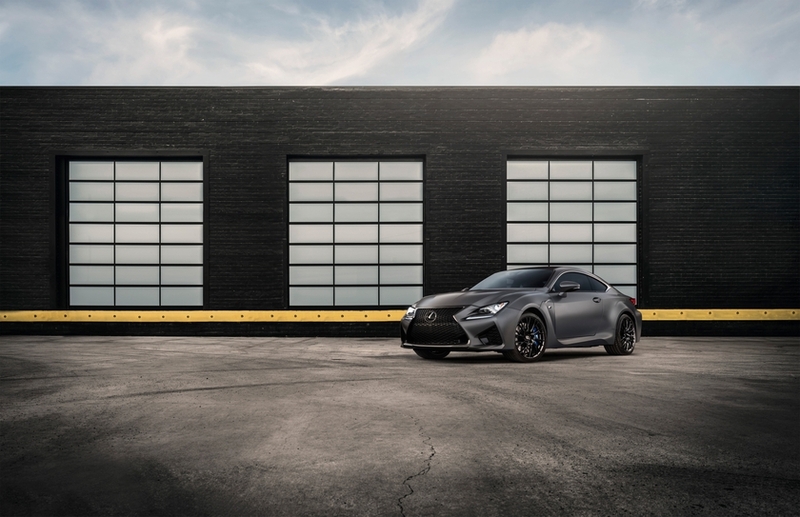 At the rear, stacked trapezoidal quad-outlet pipes add to the impression of aggressive strength, while three variations of the RC F’s 10-spoke 19” forged aluminum wheels differentiate the trim levels. A rear spoiler is functional as well as cosmetic, deploying at higher speeds to smooth airflow over the roof and boost downforce for greater handling stability. At lower speeds, it stows in the trunk lid to enhance fuel efficiency. Other notable exterior features include a hood scoop, premium LED headlamps, LED taillamps and LED daytime running lights. 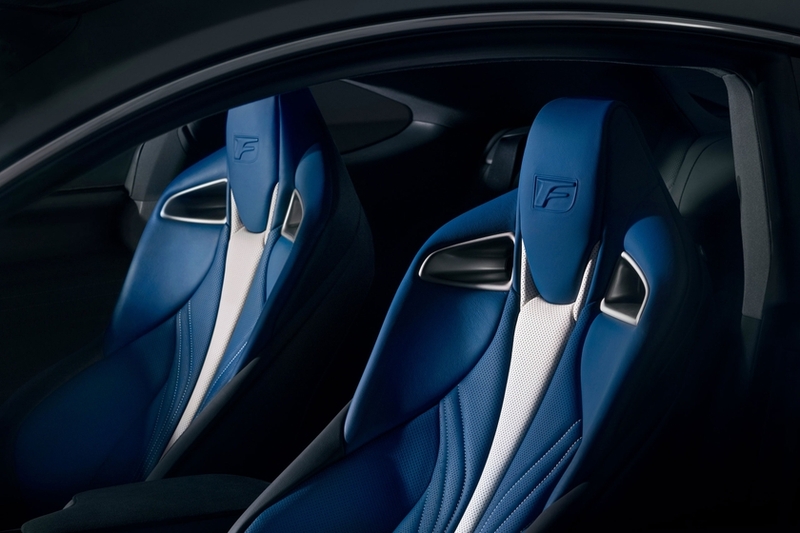 For 2019, the RC F is offered in a range of colours, including – new for this model year – Flare Yellow (unique to the Performance Package) and Matte Grey (unique to the 10th Anniversary Edition). 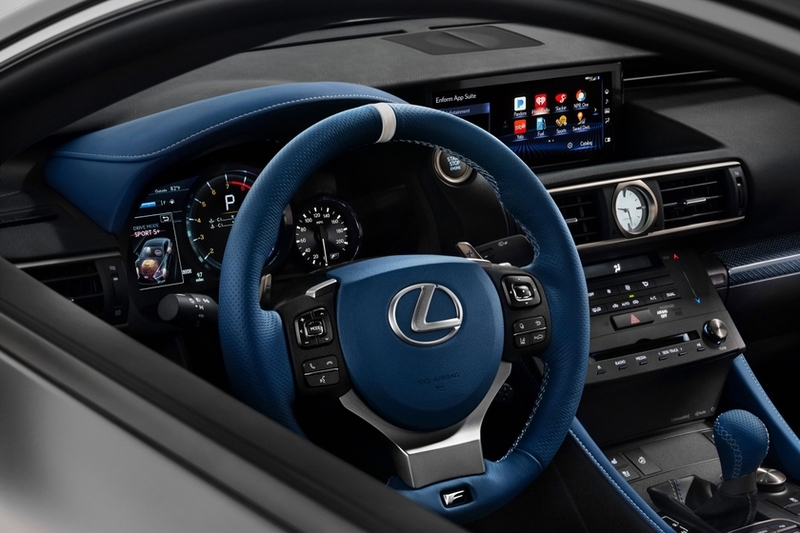 The RC F’s driver-focussed cockpit features an advanced instrument panel, including a full instrument cluster adopted from the Lexus LFA Super Car, organic LED multi-information display with Lexus customizable features, voice-activated SD card-based navigation system with Lexus Remote Touch interface, performance monitoring including tachometer, power meter, G meter and torque distribution meter, and a built-in digital stopwatch for timing laps. Meantime, the 17-speaker Mark Levinson Premium Surround Sound audio system delivers a powerful soundtrack for every drive. The audio system also includes Enform Audio with the Enform App Suite, Enform Safety Connect, integrated Sirius XM Satellite Radio, Bluetooth connectivity, and more. 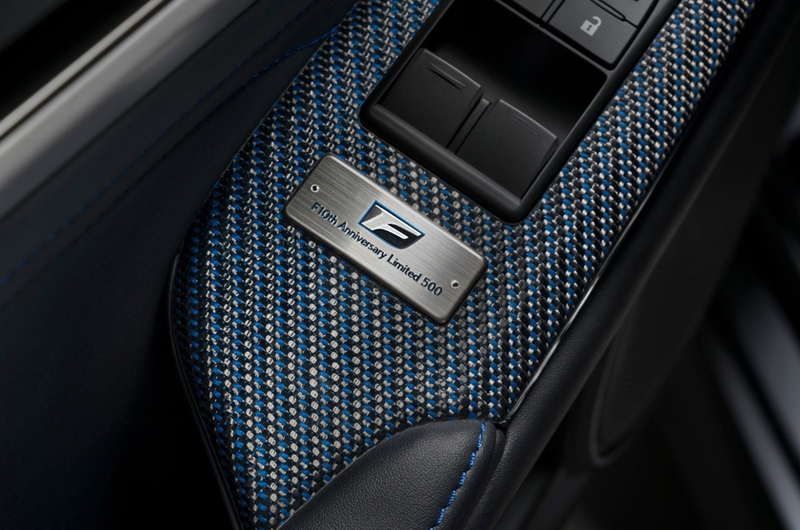 The RC F also delivers high-performance safety, starting with Lexus Safety System +. This bundle of active safety technologies (pre-collision system with pedestrian detection, lane departure alert with lane keep assist, dynamic radar cruise control, and automatic high beam system) is now standard equipment on 98% of all new models Lexus offers in Canada. LSS+ supports the driver’s awareness and decision-making under a variety of traffic conditions and contingencies. The 2019 RC F is also standard equipped with a sport-tuned Vehicle Dynamics Integrated Management, which predicts and helps prevent skids, and operates in four modes – including Expert Mode for drivers who want to hone their drifting skills. Other standard safety technologies and systems include the Blind Spot Monitor with Rear Cross Traffic Alert, eight airbags, a direct tire pressure monitoring system, an onboard first aid kit, and more. 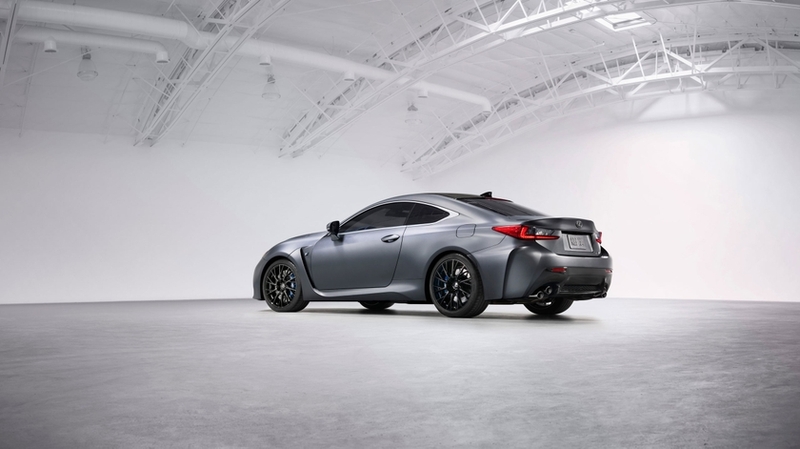 The 2019 Lexus RC F with Performance Package (starting MSRP: $95,050) adds a Torque Vectoring Differential, unique alloy wheels, painted brake calipers, a carbon fibre roof and active rear spoiler. This package does not include a moon roof. 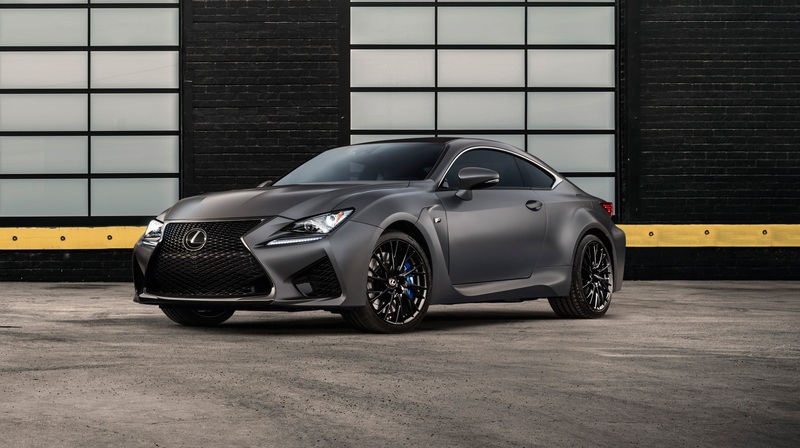 The 2019 Lexus RC F 10th Anniversary Edition (starting MSRP: $98,800) is an exclusive, limited run model built on the Performance Package, adding an embossed roof and sport-tuned performance dampers. This edition is offered in a unique matte grey exterior with black wheels and blue brake calipers, blue carbon ornamentation, and blue leather on the steering wheel and seats.